A couple of years ago during Holy Week, forty-year-old Ronnie Lambert insisted that he sing with his Mercy Choir friends. He was weak, frail and knew he was dying. It was his last performance. On Easter Sunday, Ronnie was called to his new life. At his wake, Ronnie’s choir friends, consoling each other, surrounded his casket and sang to celebrate his valiant life. 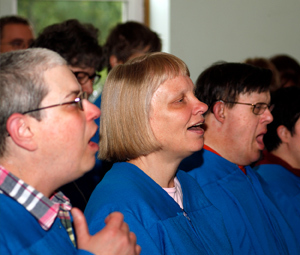 Today, Mercy Centre’s Adult Choir members still sing with passion and joy.